Habent suafata libelli. “Books have destinies of their own.” This Latin saying have been uttered so many times throughout the centuries that it has become a common-place which inspires no emotions in the reader. However, this phrase is given first so as to indicate the way that the later destinies of books can, to some extent, reveal the life stories of their former owners. In the present publication, this point is central. When in the spring of 1992 I started cataloguing the Mongolian collection in the St. Petersburg (Leningrad) State University, I had already known for many years that there were present in the collection books which originated from the private library of Kengse qinwang, alias Yunli (1697-1738), the seventeenth son of the Kangxi Emperor. What I could not imagine was the scope and size of the collection. As I was turning the pages of hundreds of volumes, big and small, for many days and months, the prince's library became familiar to me. There was no difficulty in identifying separate pages from this collection in the piles of centuries' old damaged and incomplete manuscripts, or in putting together two or even more separate parts of a torn book, or separating what was an artificially compiled volume. Amongst many others, two things impressed me greatly. 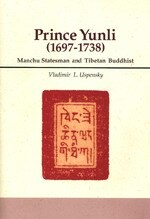 The first was the fact that Prince Yunli himself composed works on Tibetan Buddhism. The second was the accident of the anniversary—the date of this publication, 1997, is exactly 300 years since his birth. Considering this as an auspicious coincidence, I decided to prepare a separate work about Yunli in order to commemorate his jubilee and pay tribute to his spiritual efforts—bearing in mind that such a work would not be an exhaustive monograph. I may not need to point out that such diverse sources of inspiration inevitably formed this book into a mixture of Mongolian texts, bibliographical notes and fragments of historical research. Perhaps the available materials could have been moulded into a gripping work of fiction story: a Manchu prince gets acquainted with Tibetan esoteric teachings and rituals. He meets several teachers and performs many secret rites. Rivalry occurs between his Tibetan teachers; all means of war are used—sorcery, magic, etc. The prince goes to Tibet and meets the Dalai Lama himself; they establish profound spiritual friendship. The prince returns to Beijing and dies three years later. Since this publication is a scholarly work, it is limited solely to the facts supported by written sources and is not supposed to be casually read but used by interested scholars. This book came into being as a “by-product” or a companion to the catalogue of the Mongolian collection which I am presently preparing for publication. It is based almost entirely on the sources written in Tibetan and Mongolian. Limitation of time did not allow me to make a thorough research and a translation of the Mongolian texts written by Prince Yunli. My own personal limitations prevented me from using Chinese materials. Despite these regrettable imperfections I have decided to present this publication to the critical eyes of scholars as many important facts and texts can now be made known, which have been hidden by the passing of three centuries. This publication became possible through the assistance of several people residing in the different parts of the globe. The first person to be thanked is Professor Nakami Tatsuo (Tokyo). It would take a whole page to enumerate all the efforts, both scholarly and practical, which he had undertaken to make my humble work written and published. In short, without the assistance of Professor Nakami this book of mine would have not appeared. The second person who took deep concern in my work is Diana Cousens (Australia) who being a devout Buddhist and a profound scholar of Tibet, carefully corrected and re-corrected the draft version of my book not only in a limited capacity of a native English-speaker but as a competent practitioner. Also I am very grateful to Professor Christian Daniels (Tokyo) for checking my English and contributing valuable Sinological remarks, and Nina Raj (Tokyo) who patiently guided me in editorial techniques and worked to improved the appearance of my book. And the last but not the least to be thanked is Tamara Petrovna Deriagina, the curator of the manuscript division in the Oriental Department of the St. Petersburg University Library, who supported me during my work on the book treasures this library contains. Finally, I also wish to express my thanks to the staff of the Institute for the Study of Languages and Cultures of Asia and Africa, in particular to Ms. Tanikawa Katsue, Mr. Sawada Hideo and Mr. Yoshizawa Seiichiro, for their kind support.